L’Observatoire linguistique présente son service public sur les langues du monde. based on the author’s original hand-drawn compilation, published by the International African Institute, London 1977, (reproduced above in facsimile, using its temporary “Africa-based” coding system). The improved “world-based” Linguasphere coding system used on the version of the Map below follows its integration to a GISMap Info version of the 1977 Language Map of Africa, compiled by Yasir Mohieldeen (Sudan) & published by l’Observatoire linguistique & SOAS University of London in 1997 (with funding by the Leverhulme Foundation). 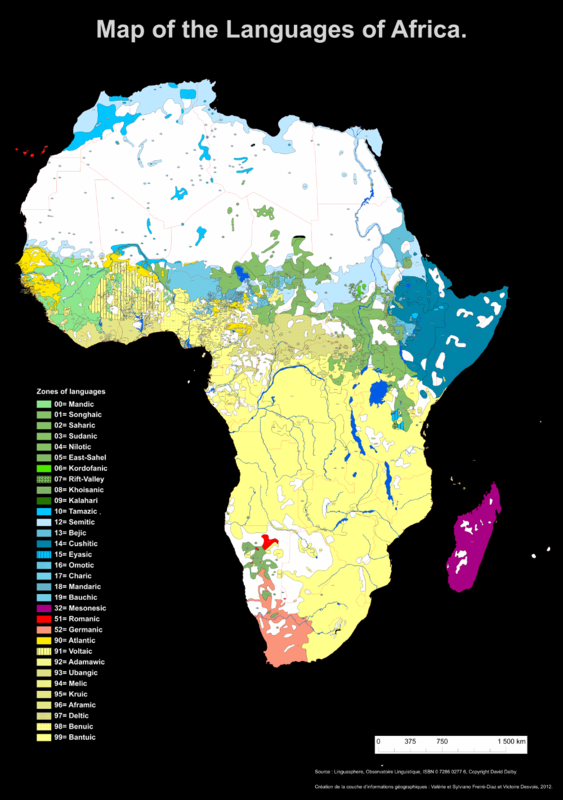 With the passage of time, since its original compilation from the 1960s, the Language Map of Africa represents the linguistic tapestry of Africa in the years before widespread Independence. Funds are now urgently sought to improve the above Map’s informational value, not only by inserting one or more (optional) layers of geographical data, but also by displaying the linguistic impact of European colonial frontiers, imposed - and often changed - with little or no reference to the realities and needs of Africa’s thousands of living linguistic communities. In the meantime, gratitude is due to the free public service provided by hortensj-garden.org in the field of language-coding, including its treatment of the coded Linguasphere Register and Index of the World’s Languages. Where users have the advantage of a double or split-screen, it is now possible for you (via the Hortensj-garden display) to view the geographic positioning of any 2-digit+3-letter language-code on the Map, alongside its 3-letter layers of close relationship, within its 2-digit layer of wider relationship (corresponding to its relevant numbered zone within the Linguasphere Register).